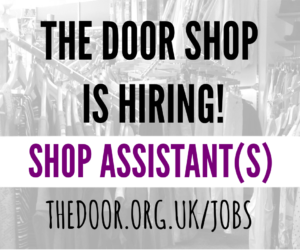 The Door Shop is Hiring! Up to 16 hours per week. Potential for job share. The Door is a Christian youth charity, established in 1991 in Stroud, Gloucestershire for the benefit of all young people aged 11 to 25 and their families. It’s a place where every young person and their parents can feel safe, happy and valued, with the best possible opportunity to reach their potential. We are currently looking for shop assistant(s) to provide cover for our shop manager in our bright and successful charity shop at the top of Stroud High Street. Reporting to the Charity Shop Manager, you will be responsible for looking after the shop in her absence, including opening and closing it, cashing up and balancing the till, sorting donations, preparing and displaying stock and managing volunteers. You should be reliable, with a cheerful disposition and commitment to good customer service, numerate and competent in cash handling, and comfortable working with a diverse group of volunteers. You need to be available for Saturdays, Monday mornings and potentially other regular times by arrangement, and be flexible to provide cover for the Charity Shop Manager’s leave and sickness. If you are only available for some of these times, your application will still be encouraged as there may be opportunities for job sharing.